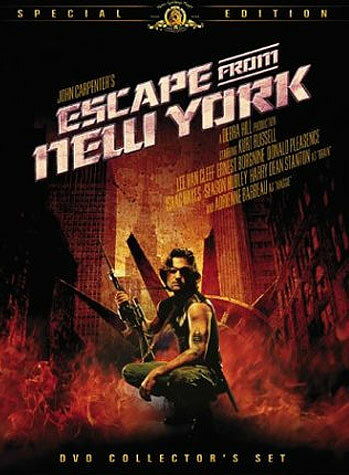 A match for They Live in terms of sheer paranoia + entertainment value, Escape from New York is a ballbuster. Who needs a peninsular Panopticon when, in the near future, all of Manhattan is a prison and there aren’t even any guards? Air Force One careens into the Big Apple, but not before the US president exits via escape pod. Unfortunately he’s been captured on the island, soon after he touched down. Luckily, there’s one man who can save the day. And that man, is Snake Plissken (Kurt Russell). He’s a former special forces op, before Steven Seagal ruined that designation in perpetuity. He’s a King of the Prison Break Movies before our rotund aikidōka ruined those as well. He wears an eyepatch and has awesome flying/shooting skills while lacking stereoscopic binocular vision.